Do you want to paint your house and don’t know where to start? 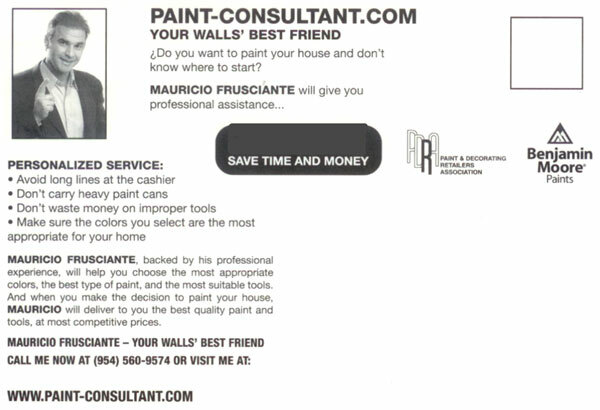 MAURICIO FRUSCIANTE, backed by his professional experience, will help you choose the most appropriate colors, the best type of paint, and the most suitable tools. And when you make the decision to paint your house, MAURICIO will deliver to you the best quality paint and tools, at most competitive prices. MAURICIO FRUSCIANTE — YOUR WALLS’ BEST FRIEND. MODERN MASTERS METALLIC PAINT 99822 ME-247 SAGE NT SIZE:6 OZ. NORTON 02636 9 X 11" 220 GRIT 3X HIGH PERFORMANCE SHEETS PACK:20 PCS. NORTON 02641 9 X 11" 80 GRIT 3X HIGH PERFORMANCE SHEETS PACK:20 PCS. WOOSTER 4232 ALPHA FLAT SASH BRUSH SIZE:3" PACK:6 PCS.